Battling recurring breakouts of pimples is one of the most frustrating things you might ever have to do. For that reason, scientists and beauty bloggers alike are constantly looking for new ways to help you win this fight. Luckily, a natural product called castor oil may be the remedy you have been seeking. But let us first discuss the nature of acne. Castor oil naturally refreshes the skin, cleaning it from excess oil and germs. Acne normally occurs when your pores become excessively clogged – whether with sebum or with bacteria. Sebum is produced by the sebaceous glands, which are normally responsible for moisturizing your body. Whenever they over-produce oil for your skin, it ends up blocking your pores and you may get irritated, red bumps on your face, as well as on your neck, chest and back. On the other hand, a build-up of germs can also cause acne, which can result from an unhygienic environment, forgetting to clean your makeup, etc. Lastly, acne can be caused by a hormonal imbalance, an unhealthy diet, stressful lifestyle, or even by certain medication. Indeed, even some medications which are specifically designed to rid you of acne, can in their turn cause an even bigger breakout. For this reason, your best bet may be to opt for a natural remedy. One such solution is castor oil. Castor oil naturally refreshes the skin, cleaning it from excess oil and germs. How does that work? The product contains fatty acids of the triglyceride kind, as well as undercylenic acid, which combat bacteria, and disinfect your complexion. The ricinoleic acid in castor oil fights any visible irritation of the skin, while the vitamins and antioxidants in it help your skin generally rejuvenate itself. 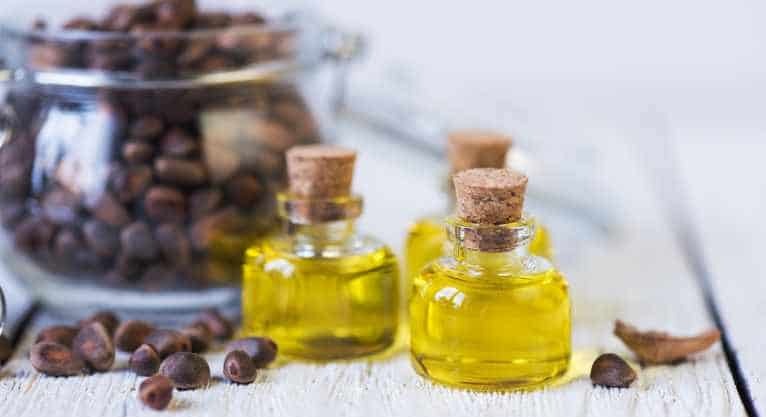 Castor oil also provides preventive care for your skin, hydrating you and preventing the development of germs, while encouraging your skin to produce extra collagen. Just rub some of the product into your skin – this will not only improve blood flow, but it will also exfoliate any dead, useless cells. Additionally, if your acne is caused by fungus, the oil will fight this kind of inflammation, too. On the other hand, if you already happen to have scars from past breakouts, castor oil can also help you get rid of those. As with most natural acne-fighting products, you can use castor oil on its own or with other substances. For your benefit, we outline some ways in which you can use this natural remedy to combat, and prevent, skin problems. Castor oil is typically applied to skin in combination with other essential oils. It can simply be grouped with olive oil, or with oil from almonds, camphor, jojoba, grape seeds, sunflowers and coconuts. A mixture of equal parts castor and almond oil can be boiled in a pot and used both as a an ointment, as well as a steam bath for your face. If you choose to lather it on your face, you might want to add a teaspoon of camphor oil and rub the mixture into fully cleansed skin. Don’t forget to opt for a gentle facial cleanser, so as to not exhaust your complexion. Allow yourself to sleep with the oil mask and rinse it off in the morning using water that is not too hot, nor too cold, so as to avoid irritation. Alternatively, if you like the idea of steaming your face with the mixture, leave the camphor oil out, put a towel over your head to lock in the vapor, and let your face absorb the steam for a third of an hour. After this procedure, you might want to still rub the mixture into your face for best results, leaving it overnight, and rinsing it well in the morning. What is more, you can also use castor oil on its own, but make sure to first test it on a patch of skin, so as to avoid possible irritation of using the essential oil without any additives. This is a harsher form of therapy and it works best on severe forms of acne, such as the cystic kind. Only a couple drops are needed for this method – massage these into your skin and leave the mask on only for an hour or so, before cleansing. If you are looking for a quick fix, do not hesitate to do this twice per day, or even to leave the mask on overnight – but only if there is no resulting irritation of the skin. Furthermore, you may want to make use of the nightly castor oil steam cleanse for combating recurring acne. Steam your face over a pot of boiling water with a towel on, then use another clean, wet, warm towel to softly massage your face. After a few minutes, drip half a tablespoon of castor oil into the towel, and massage your face with it for another minute. Clean everything off the affected area, dry it out, and use cold water to close your pores. To finish the procedure, rub two drops of the oil into your face and go to bed with this thin mask. Clean your face with a gentle cleansing product and gently exfoliate as soon as you wake up. Another way to use castor oil for a better complexion is to combine it with olive oil. The mixture you need is composed of two tablespoons of castor oil and one tablespoon of olive oil. Generously lather this on your skin with your fingers, and either leave it on for half an hour – in mild cases, or overnight – in more severe situations. Use a clean, wet towel to remove the mask. All of these methods should be repeated on a nightly or on a daily basis for best results. The way to use castor oil with jojoba oil is to mix in a teaspoon of the first with three teaspoons of the latter. Rinse the affected area with water and lightly rub the oils in. In order to encourage the mixture to soak into your skin, you might want to leave a hot, wet towel on the affected area for 60 seconds. Rinse it all off with cool water and do it again on a regular basis if you want to achieve the best possible results. Castor oil can also be used with organic coconut oil on a daily basis, in order to relieve recurring breakouts. A tablespoon of castor oil should be combined with a bit more than two tablespoons of coconut oil of the organic sort. Before applying the mixture, open your pores by steaming your face over a boiling pot of water, using a towel over your head to lock the steam in. Then, rub the oils into your skin and leave them on anywhere between 20 minutes and an entire night, depending on the severity of the problem. Whenever you are done, rub the oils off with a wet towel and cleanse the skin. Another method involves mixing a tablespoon of castor oil with more than two tablespoons of sunflower oil and gently rubbing them into your skin. This mask should only remain in place for 10 minutes, after which it should be taken off with a wet towel. You can also indulge in this mask on a daily basis in order to defeat your acne. If you want to calm your sebaceous glands, you should opt for mixing castor oil with oil from grape seeds. A mask made of an equal amount of each of these products, in combination with two drops of lemongrass oil, neem oil or Indian lilac oil, and the infamous tea tree oil should do the trick. This mask requires you to rub it into the affected areas for several minutes before leaving it on while you sleep. The last part of the procedure involves placing a hot, wet towel on your face in order to let the mixture soak in once more. Dip the towel back into warm water a couple times, and keep placing it back on your face. In the end, you might want to tone your face with a cotton pad dabbed with apple cider vinegar. You can repeat this from time if you just want to cleanse your skin, or repeat it daily in order to fight severe breakouts. What are some things to keep in mind when using castor oil to get rid of your acne? First of all, as with most products you must keep it out of your eyes at all costs. Secondly, before beginning treatment, make sure you adjust the amount of oil you need in accordance to your skin type. For example, if you notice that the product does not come off your skin ease, you may need to use water and baking soda to take it off completely. Depending on your individual case, castor oil may work only if you apply it a few times a day, instead of just once. Moreover, castor oil may not work for you at all, in which case it might even sharpen your problem. You might want to pay a visit to your doctor if this happens, or if you do not notice any effects at all after applying any of these masks for over a month. It might also be useful to visit a dermatologist if the oil causes a noticeable skin irritation. Particularly, some people find that they are allergic to this ingredient, in which case you should avoid it altogether. If you want to keep trying, do not forget to dilute the oil with any of the other outlined ingredients (especially because of the increased level of viscosity of the product). Regarding the kind of castor oil you should look for, opt for the cold pressed kind, or even for pure castor oil. You can also find the component in various soaps that are especially designed to fight acne. If you decide to use such a soap, always first rinse the affected area with warm water, so as to open your pores, then close them using cold water. There are also various kinds of castor oil, so you truly have a rich range of options when choosing the best variety for your skin. For instance, the manner preparation of Jamaican black castor oil includes ash which contains fatty acids and phytochemicals. These refresh your complexion and decrease the activity of the sebaceous glands, too. Additionally, hydrogenated castor oil has a waxy texture because it is in a very pure form. Both of these can help you combat acne and can be used for the aforementioned castor oil steam cleanse. While you can rely on castor oil to effectively cleanse your skin and unclog your pores, you should always remember to take care of your complexion by maintaining a good eating regime, involving lots of natural ingredients. Decrease your sugar intake and avoid foods rich in carbs. Stay hydrated, clean your face religiously, and do sports in order to maintain a healthy, fresh and glowing physique. Acne-be-gone! Can a Supplement Help Cure Your Acne?